Milovan Đilas or Djilas (Serbian Cyrillic: Милован Ђилас) (June 4, 1911 – April 20, 1995) was a Montenegrin Serb, Communist politician, theorist and author in Yugoslavia. He was a key figure in the Partisan movement during the World War II as well as in the post war government, and became one of the best known and most determined critics of the system, domestically and internationally. His book, The New Class was a devastating critique of Soviet-style communist bureaucracies which claimed to have created a classless society but in fact had merely replaced the bureaucrats of the old system with those of the communist system. Djulas was widely hailed in the West for his sober analysis of the ideological failings of the communist system. Born in Podbišće village near Kolašin in Kingdom of Montenegro, he joined the Communist Party of Yugoslavia as a Belgrade University student in 1932. He was a political prisoner from 1933 to 1936. In 1938 he was elected to the Central Committee of the Communist Party and became a member of its Politburo in 1940. 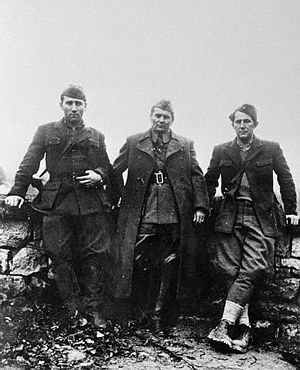 In April 1941, as Nazi Germany, Fascist Italy and their allies defeated the Royal Yugoslav army and dismembered the Kingdom of Yugoslavia, Đilas helped Tito found the Partisan resistance, and was a resistance commander during the war. Following Germany's attack on the Soviet Union on June 22 (Operation Barbarossa), the Communist Party of Yugoslavia's (KPJ) Central Committee decided that conditions had been created for armed struggle and on July 4 passed the resolution to begin the uprising. Đilas was sent to Montenegro to organize and raise the struggle against the Italian occupying force, which on July 12, 1941, proclaimed the fascist puppet entity, the "Independent State of Montenegro" run by figurehead Sekule Drljević, but in actuality closely controlled by Italian authority led by Mussolini's confidant Alessandro Birolli. Đilas played an important role in the July 13 uprising, a collaboration of groups spanning ideological lines, in which large parts of Montenegro were quickly liberated. Đilas remained in Montenegro until November, when he left for the liberated town of Užice in Serbia, where he took up work on the paper Borba, the Party's main propaganda organ. Following the withdrawal of the Supreme Commander Tito and other Party leaders to Bosnia, Đilas stayed in Nova Varoš in the Sandžak (on the border between Serbia and Montenegro); from there he retreated with the units under his command in the middle of winter and in difficult conditions to join the Supreme Staff. There were no serious divisions or conflicts between communists and non-communists among the insurgents. It was only in March of next year that he went back again to Montenegro, where in the meantime a civil war between Partisans and Chetniks had broken out. Momčilo Cemović, who has dealt mostly with this period of Đilas' war activities, believed that the CPY Central Committee and the Supreme Staff had sent Đilas to ascertain the actual state of affairs and to dismiss the communist leaders responsible. This, in fact, he did. In 1944 he was sent to the Soviet Union to meet with Joseph Stalin. He fought among the Partisans to liberate Belgrade from the Wehrmacht. With the establishment of the Socialist Federal Republic of Yugoslavia, Đilas became Vice-president in Tito's government. It is generally agreed that Đilas was not directly or indirectly involved in the Bleiburg massacre. Initially the Yugoslav communists, despite the break with Stalin, remained as hard line as before but soon began to pursue a policy of independent socialism that experimented with self-management of workers in state-run enterprises. Đilas was very much part of that, but he began to take things further. Having responsibility for propaganda, he had a platform for new ideas and he launched a new journal, Nova Misao ("New Thought"), in which he published a series of articles that were increasingly freethinking. He was widely regarded as Tito's eventual successor, and was about to become President of Yugoslavia in 1954. However, from October 1953 to January 1954 he wrote 19 articles for the Borba journal, in which he demanded more democracy in the party and in the country. Tito and the other leading Yugoslav communists saw his arguments as a threat to their positions, and in January 1954 Đilas was expelled from the government and stripped of all party positions for his criticism. He resigned from the Communist Party soon afterwards. In December 1954 he gave an interview to the New York Times in which he said that Yugoslavia was now ruled by "reactionaries." For this he was brought to trial and convicted. According to Joseph Stalin and the communist movement, they had succeeded in erasing class distinctions. However, in 1955 Đilas published The New Class: An Analysis of the Communist System, in which he argued that communism in Eastern Europe was not egalitarian, and that it was establishing a new class, a privileged party bureaucracy that enjoyed the material benefits from their positions in the same way that the old ruling class had. Prior to 1917 theories of a new stratum of managers, engineers and other technocrats were highly popular within the broad Socialist movement. In particular, managers, engineers and other technocrats used the idea that they were an "intellectual proletariat" to argue that they could be a motive force for revolution separate to the mass of wage earning laborers. At the time, as these technocrats did not work for wages, their claim lies outside of standard Marxist understandings of the proletariat. In his 1948 novel Nineteen Eighty-Four, however, George Orwell would note that "The new aristocracy was made up for the most part of bureaucrats, scientists, technicians, trade-union organizers, publicity experts, sociologists, teachers, journalists, and professional politicians." This technocratic meaning has continued to be associated with the term "new class" throughout the twentieth century. Djilas claimed that the new class' specific relationship to the means of production was one of collective political control, and that the new class' property form was political control. Thus for Djilas the new class not only seeks expanded material reproduction to politically justify its existence to the working class, but it also seeks expanded reproduction of political control as a form of property in itself. This can be compared to the capitalist who seeks expanded value through increased sharemarket values, even though the sharemarket itself does not necessarily reflect an increase in the value of commodities produced. Djilas uses this argument about property forms to indicate why the new class sought parades, marches and spectacles despite this activity lowering the levels of material productivity. Djilas proposed that the new class only slowly came to self-consciousness of itself as a class. On arriving at a full self-consciousness the initial project undertaken would be massive industrialization in order to cement the external security of the new class' rule against foreign or alternative ruling classes. In Djilas' schema this approximated the 1930s and 1940s in the Soviet Union. As the new class suborns all other interests to its own security during this period, it freely executes and purges its own members in order to achieve its major goal of security as a ruling class. After security has been achieved, the new class pursues a policy of moderation towards its own members, effectively granting material rewards and freedom of thought and action within the new class—so long as this freedom is not used to undermine the rule of the new class. Djilas identified this period as the period of Khrushchev's government in the Soviet Union. Due to the emergence of conflicts of policy within the new class, the potential for palace coups, or populist revolutions is possible (as experienced in Poland and Hungary respectively). Finally Djilas predicted a period of economic decline, as the political future of the new class was consolidated around a staid programm of corruption and self-interest at the expense of other social classes. This can be interpreted as a prediction of the Brezhnev era stagnation by Djilas. While Djilas claimed that the new class was a social class with a distinct relationship to the means of production, he did not claim that this new class was associated with a self-sustaining mode of production. This claim, within Marxist theory, argues that the Soviet-style societies must eventually either collapse backwards towards capitalism, or experience a social revolution towards real socialism. This can be seen as a prediction of the downfall of the Soviet Union. Robert Kaplan's 1993 book Balkan Ghosts: A Journey through history also contains a discussion with Djilas, who used his model to anticipate many of the events that subsequently came to pass in the former Yugoslavia. In 1956, Đilas was arrested for his writings and for his support of the Hungarian Revolution and sentenced to nine years in prison. While jailed, Đilas remarkably translated John Milton's Paradise Lost into Serbo-Croatian. In 1958 he also wrote a memoir entitled Land Without Justice and was imprisoned again in April 1962 for publishing Conversations with Stalin. During his previous internment in 1961 Đilas also completed a massive and scholarly biography of the great Montenegrin prince-poet-priest Njegos. Đilas was redeemed in the eyes of the West despite his communist leanings, and remained a dissident, almost hero in the eyes of many western powers. He was also opposed to the breakup of Yugoslavia and the descent into nationalist conflict in the 1990s. Despite his decades of dissident activity he continued to think of himself as a communist and continued to believe in communism. His ideas about how Socialist Yugoslavia should be organized was the root of his split with Tito. ↑ David Binder: Thoughts About Serbs Milovan Djilas: "Montenegrins are Serbs." Retrieved October 24, 2007. All Links Retrieved May 13, 2008. Zinaic, Rade. "Crucified Wilderness: The Tension Between Tradition and Modernity in the Djilasian Void." East Central Europe. 29. 2002. 1-2, 27-44. A meta-list of relevant publications Related to Richard Barbrook (2006). Registan (October 1/06) - The "New Class": The Rise and Fall of NGOs in Central Asia Quotes extensively from a presentation by Laurence Jarvik to the Central Eurasian Studies Society, held the University of Michigan. Founding editor Nathan Hamm was a Peace Corps volunteer in Uzbekistan. Mutualist.org - Liberalism & Social Control: The New Class' Will to Power Most New Class criticism comes explicitly from either the Left or the Right. Rarely does one seem to come from both at once. This page was last modified on 21 August 2013, at 14:44.